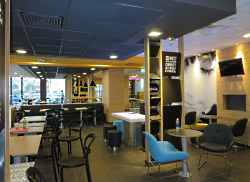 Alliances Integrated Systems has completed the design and installation of an Audica Professional audio system for the first McDonald's restaurant in Vietnam. "Our team proposed a solution providing the coverage, zoning and functionality the restaurant required, but the decision was only made after we gave a demonstration to show the system's capability and audio quality," explained Vu Viet Tung, Business Development Manager of Alliances Integrated Systems. "Not only were we able to exceed expectations, but also meet the required budget." The system is controlled by an Audica MICROzone amplifier/controller, which provides the three inputs for a CD player with USB reader, an MP3 player and a PC. Two Audica MICROplus 4-channel amplifiers provide the power for the six zones of the system. Three of the indoor zones use four Audica MICROdot ceiling loudspeakers, with the sound level locally controllable by Sonance volume controls. Two further indoor zones are each fitted with two MICROdot ceiling loudspeakers. An outdoor zone operates with two Audica MICROpoint loudspeakers under a covered area and two Quest MS401 all-weather loudspeakers for an uncovered area. 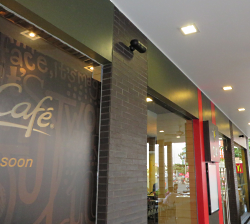 One amplifier channel of the MICROzone amplifier/controller is additionally used to power a MICROdot ceiling loudspeaker in the manager's office, so the system output and general volume levels in the restaurant can be monitored and controlled. "It is also useful that each channel of the MICROplus amplifier has LED output level meters, enabling the different levels in each zone to be visually monitored and adjusted when needed," added Tung. "We are very impressed with the style and quality of the Audica Professional MICROseries system," concludes Tung. "The DSP built into the MICROzone provides audio performance which is exceptional from such compact, discreet loudspeakers. The system is also extremely flexible, allowing us to design systems that fully meet the needs of the client."